On our way back to Tinchuley, we took a detour through a forest in Takdah. The dense forest at the dusk appeared a dreamy sight for us. With tall trees all around us, it seemed as though we were in a different world all together. Shown in this picture is a tree that was uprooted during the rains in last couple of days. What a sight it was! This tree got uprooted and fell right onto another tree on the other side of the road splitting it straight through the middle. Had it not been the other tree, we would have got stuck as the only way out of this jungle was to go all the way back in reverse gear! There was no way we could have turned the Bolero! While returning to our guest house at Tinchuley from the Triveni ‘Sangam’ mini-beach, Jaishree tried her hands at the wheel of our Bolero. 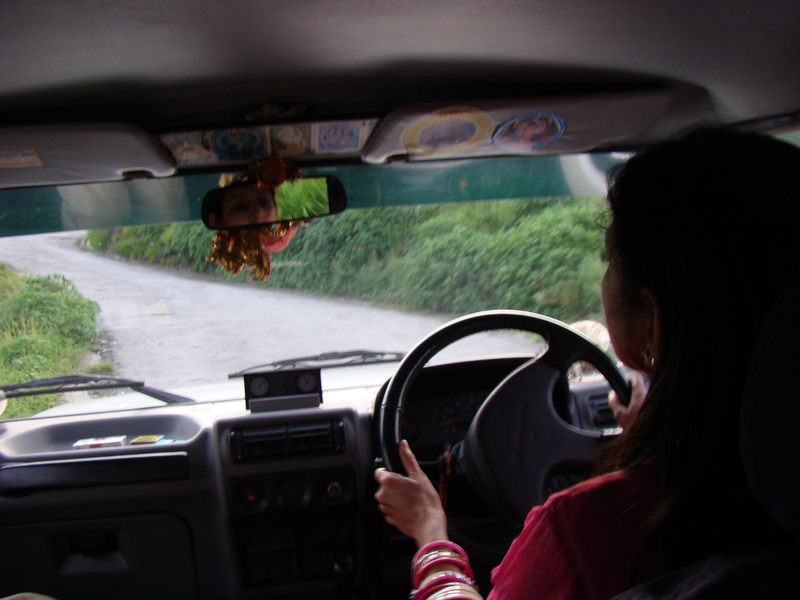 For her, it was a thrill drive through the steep mountaneous roads of the Teesta valley. For me, it was an edge of the seat experience especially whenever she manouvered the jeep round the curves. For our driver Milan, keeping an alert watch, it was more tiring than driving himself! Nevertheless, these five-ten minutes were quite a fun for Jaishree and she really enjoyed driving on the hills. Jaishree tried her hands at fishing with the help of some local fishing guys. 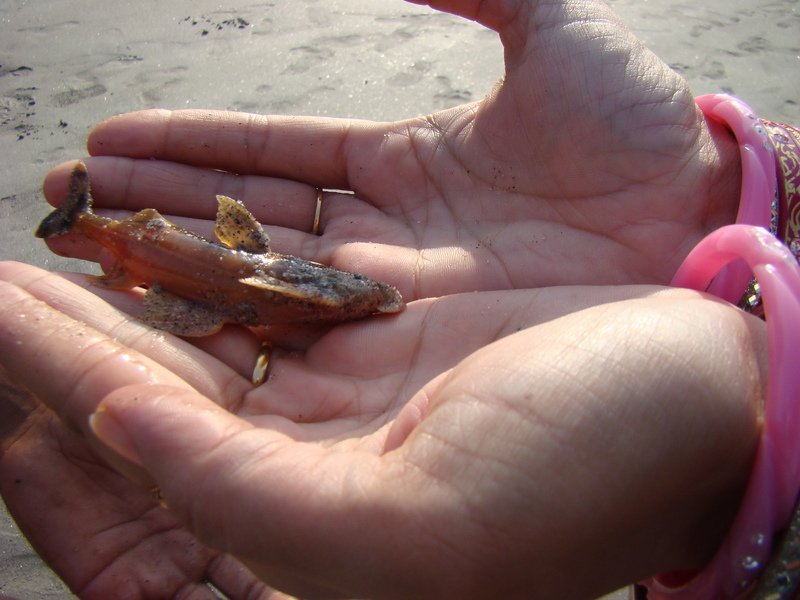 Shown here in this photograph is her catch which she couldn’t hold for more than a few seconds! The ticklish feeling had her throw it down no sooner than it landed in her palms! Just long enough for this photograph to be taken. This picture was taken right at the banks of the two rivers. From the left is the Rangeet coming in to join the Teesta which is flowing in from far behind on the right. The Teesta with Rangeet merged in, then continues towards the near end on the right. This is a view that just captivates you. Triveni view point offers a panoramic view of the ‘sangam’. This is the point where the rivers Rangeet and Teesta meet. This junction divides the land in to Sikkim, West Bengal and the earstwhile portions of Bhutan. Summer of 2009 – Day 4, contd. Looking at the gravity of landslides, we had to cut short our visit to Darjeeling and return back. We then decided to return back to Teesta valley and enjoy the forests on the way to Triveni. We drove through the jungles to the Teesta Tea Estate. Lush green stretches made our day. We even tried sliding down the tea plants in the slopes and had fun doing so. Jaishree was just freaking out laughing at me slipping down and getting stuck at a shrub. Continuing from the forests we reached the Triveni view point. This view point has been developed just to provide a panoramic view of the ‘sangam’. Triveni is the point where the river Rangeet joins the river Teesta and provides for a magnificient view. The Rangeet is comparitively rapid than the Teesta. This junctions divides the land into the parts of Sikkim, West Bengal and erstwhile portions of Bhutan. We then drove down further right to the shores of the rivers and spent some time on the white beach. Jaishree even tried her hands at fishing but could not handle the catch! The moment a fish landed in her hands she couldn’t suppress the ticklish feeling and immediately threw it down! At least she held it for a couple of seconds just enough for a photograph to be taken. After having spent nearly an hour or so at this mini-beach we drove back to our guest house at Tinchuley. Let’s see if the weather improves tomorrow and the landslides get cleared up for our trip to Gangtok. Tinchuley and Takdah valley hosts quite a number of tea plantations. This picture is of the Teesta Tea Estate. Tea plants give a green slush to the entire landscape. 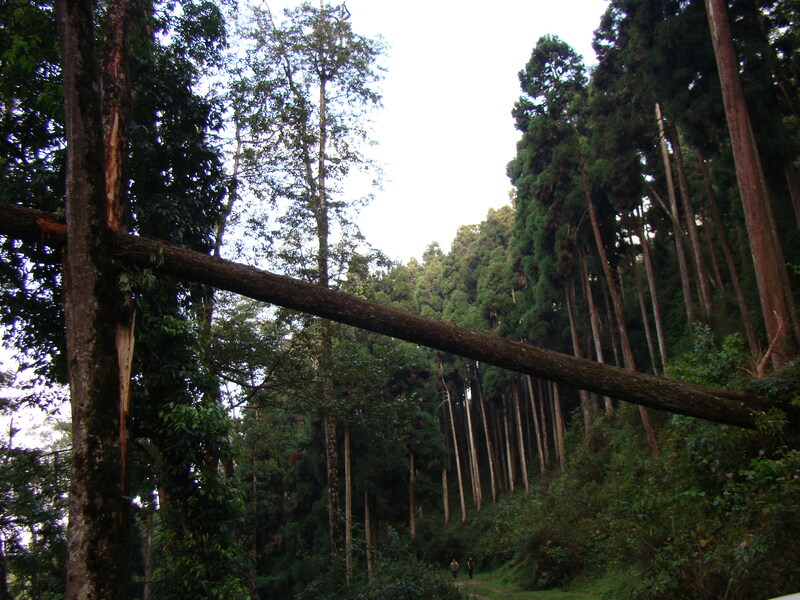 These kind of trees dotted our way to Darjeeling from Tinchuley. In fact there is a thicket comprising such trees at the backyard of Takdah valley. Some of these trees go to a height in excess of 100 feet. Looking up at them from ground gives a chill up the spine. Pine. This is what we got to see from the view point at Tinchuley. Kunchenjunga in its majestic glory gave us a glimpse for a few minutes in the morning when the clouds and mist cleared. As the morning was greeted by a brilliant sun, the dense clouds eased up and the mist cleared a little. We walked up to the view point at Tinchuley near our guest house. Got a glimpse of the majestic Kunchendzhonga range. Showing in this picture is Jaishree with a backdrop of Mt. Kunchenjunga.